We’re honored to have Loan Officer and Co-Owner of First Commerce Financial at All Things Finance. Click here if you’d like to know more about Guest Posting. Wow – If I had a nickel for every time I have heard that in the last 16 years, I could retire a wealthy man! Just kidding, but you probably already caught the sarcasm. The goal of many homeowners is to pay down the mortgage as quickly as possible so they can be debt free on their home. For those who can afford to, paying extra each month on your mortgage is a smart way to do that. But refinancing your mortgage is another option that can be equally effective, so you have to compare the options. Caller: Hi, I was calling to check in and see what your 15 year fixed rate is? Loan Officer: Great. 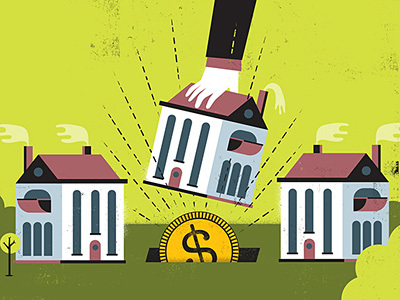 What is the balance on your current mortgage and what rate are you borrowing at? Caller: I am at 5.0% on my current mortgage but I have been aggressively paying it down. Loan Officer: That is great news. Having no mortgage or paying it down quickly is the ultimate goal for most. The 15 year fixed rates are in the mid 3’s. Caller: Well, then it probably does not make sense for me to refinance. I will just continue to pay extra on my current loan. I swear I have fielded that same call over 150 times in the last 5 years. A refinance transaction should be viewed as a math equation. Don’t try to make it harder than it is or let less significant details cloud the big picture when determining if it makes sense or not. There are an equal amount of times that it makes sense to keeping your current loan at an aggressive payment schedule, as there are scenario’s where you should take advantage of the lower rate. The point is that we have done these thousands of times for a reason; your loan officer is an expert and there has to be some of our experiences that can help you. We will walk you through an amortization schedule and show you on paper how the math plays out and see if it makes more sense to refinance or continue paying extra on your current loan. You can download a basic amortization schedule to use in excel along with a video on how to use it here. Understanding how amortization works can be confusing. Amortization is the process of paying a loan to $0 over time. A mortgage is interest-heavy in the beginning years. There is very little that goes towards paying down the principal balance in the first 5-10 years of a 30 year mortgage. Checkout All Things Finance’s list of Home and Mortgage Calculators here. Are you looking to open a new business or make a career change? Are you looking to pay off existing consumer debt? Are you prepared for College or wedding expenses that are coming? Are you contributing the maximum to your retirement accounts? Is retirement and a fixed income in the near future? Most folks do not want to take the time to try and understand if they should keep their existing note or refinance to a new one. It’s tricky and sometimes you can be intimidated by the math. It feels like someone is trying to “sell” you something. Read about refinancing lessons learned from an Average Joe. If you have an existing mortgage and you want to see how extra payments made affect when your loan will be paid off payoff vs. taking on a lower rate or shorter term with a refinance, call your local, experienced mortgage broker. They will take the time to walk you through it. About the Author: Kirk Chivas is a licensed Loan Officer and co-owner of First Commerce Financial, LLC, a mortgage brokerage based in Wixom, Michigan. With over 16 years of experience, Kirk has committed to providing Michigan residents with accurate and honest mortgage advice. If you have any questions about your current or future mortgage needs, please feel free to ask Kirk a question over on his website. Knowing how to use an amortization calculator is a huge benefit to homeowners and will show them if refinancing makes sense for them. Too many people refinance to a new mortgage when they only have a few years left for a lower monthly payment. But they end up paying thousands more because they were paying mostly principal on the old loan and are not paying mostly interest on the new loan. Well said Jon. The numbers never lie! You have to always weigh out the costs and the savings to see how long it takes to break-even and see if the refinance really helps you.